Great Service and Value! Guaranteed Unit Condition. 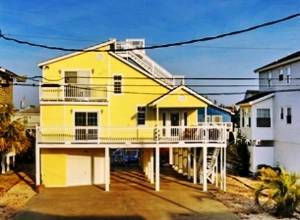 Beach Daze is a lovely beach house on stilts with 4BR, 3BA, sleeps 10 people and is located on the channel within walking distance of the beach. 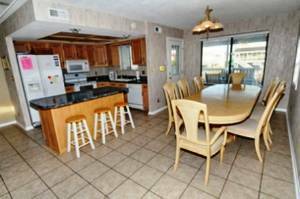 The kitchen is nicely furnished so that you may cook during your North Myrtle Beach vacation. 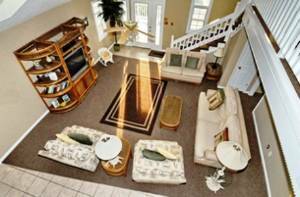 This beach house has wireless, numerous televisions and also a handful of DVD players. You will likely take advantage of the washer and dryer during your stay because these amenities are wonderful to have. This vacation rental has a grill on site so you can cook out on the waterfront. 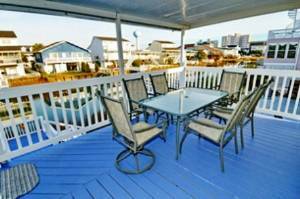 Just a few blocks away is the Atlantic Ocean and the white sandy beaches. No Pets. Bringing a pet will result in eviction with no monies refunded. We rent to families and responsible adults only. No house parties. Ripleys Aquarium, Believe It or Not Museum, Haunted Adventure and 4-D moving theater, Imax Theater, ice cream shops, outlet malls, seafood restaurants, water sports, miniature golf, indoor miniature golf, championship golf, Casino Boats, shopping, gourmet dining, concerts, live theatre, Dolphin Sighting Cruises, Fishing Charters, freshwater fishing, Family Kingdom amusement park, water parks, museum, fitness center, day spas, jet ski rentals, parasailing, windsurfing, kayaking, biking, shelling, surfing, swimming, Myrtle Beach Pelicans professional baseball team, Broadway at the Beach, Barefoot Landing, Tanger Outlet Centers, Alligator Adventure, Alabama Theatre, Dolly Partons Pirates Voyage Fun, Feast and Adventure, Carolina Opry, House of Blues, Medieval Times Dinner & Tournament Show, Le Grande Cirque, Legends in Concert, banana boat rides, Brookgreen Gardens, Huntington State Park and much more! 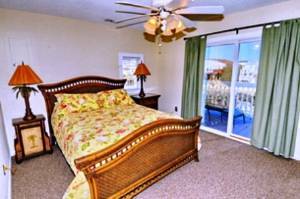 Prices are set according to location of rental property, property condition, number of bedrooms, and amenities offered with rental property. Rates are higher Easter, Memorial Day, July 4th, Labor Day, and special event weeks. Note: Please note rental rates are subject to change and may increase or decrease depending on availability. Existing reservations with prepayment are excluded. Deposit: No security deposit is required if the guest has a valid MasterCard or VISA on account. If a valid MasterCard or VISA is not presented the guest will be required to pay a $500.00 cash security deposit. If required please allow up to four (4) weeks for return of deposit. Cancellations and Refunds: Confirmed reservations are not transferable. Confirmed reservations may be cancelled by written notice. Upon confirmation, the rental property is off the market to anyone else; therefore, the advance deposit will be refunded only if the property is re-rented at the full rental amount. All refunds are subject to a $100.00 cancellation fee. 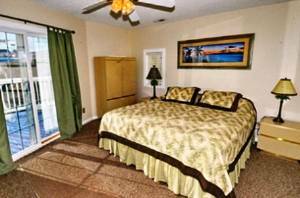 Other Fees: 13% tax, $2.00 per night resort fee and a non refundable processing fee 5% of rental amount, $25 minimum. (Subject to change) Linen packages are available at a fee of $35 + tax per bed.